Yes, I know that shampoo is the devil itself, and without it every curly would be better off, but I still like the stuff. It’s hard to explain the love affair I have with shampoo. At times, we fuss and fight and I reconsider my use of it, but when it comes down to it, I reach for my bottle and lather up, every week. 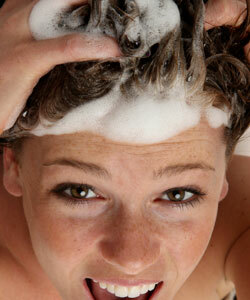 The simple fact is, I love shampoo, and here’s why. I always hear women go on about hair that has a squeaky clean feel to it and how much they hate it. When I first heard it, I was confused because that's what I use my shampoo for, to get my hair all the way clean. That squeaky clean feel is how I know I got all the gunk out, and trust me, I want it all out. After a week of heavy butter and oil laden products, and whatever else you concocted in your kitchen, wouldn’t you want to rid yourself of all of that and start afresh? Unless I get all sciency and pull out my handy microscope and start examining individual strands, there really is no way for me to know if I’ve got it all, but squeaky hair is almost a 100 percent guarantee. Did Da Vinci grab some scrap from the back to paint the Mona Lisa? No! Thus, I need clean hair to begin the process of what will undoubtedly be a masterpiece. Now some of you may ask why it’s so important to me that my hair be that clean. Did Da Vinci grab some scrap from the back to paint the Mona Lisa? No! Thus, I need clean hair to begin the process of what will undoubtedly be a masterpiece. We all know how badly behaved hair that has product build up can be. Also, I use very persnickety products that can, at a moment’s notice, form white balls if the wrong product is used on top or underneath it. All that included, I need clean hair. I don’t know about you, but having an itchy scalp is not something I enjoy. I have perfected the art of inconspicuous scalp scratching, but I’d rather not have to use those skills regularly. I need to have a clean scalp. No matter how hard I try to avoid putting product near my scalp and not applying anything to it, when I eventually do my scalp test, which involves scraping it with my nail lightly, I will eventually scrape off some gunk. When that happens, I am not going to grab something weak and scratch at my scalp and hope it all gets out. If I need to get from A to Z, why stop off at the 24 letters in between? I’m grabbing the heavy duty stuff that will get the job done with minimal effort. And I think the most important reason I use shampoo is because I don’t use all-natural products. I know, I’m such a naughty natural. Don’t leave me hanging! How often do YOU use shampoo?